The long and short of it: This high quality widespread bathroom lavatory sink faucet represents a high-quality addition to any bathroom. This item includes two stylish handles and a matching finish metal bathroom sink pop-up drain. Sold complete with the Delta lifetime warranty on both the operation AND the finish. Order yours today and find out what makes Delta the industry leader in Bathroom fixtures. Buy this item if: You are looking for a high-quality Bathroom sink faucet that comes with everything needed for installation - and looks great too! 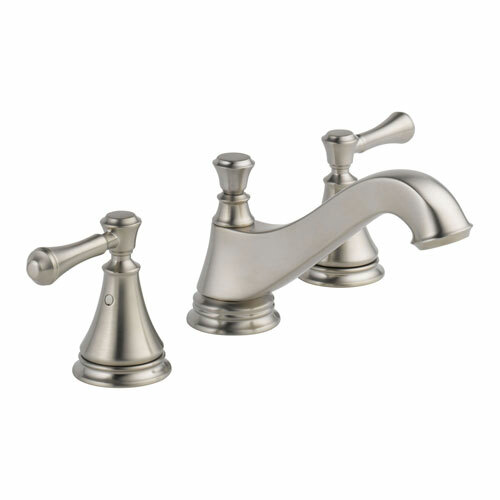 Buy this Delta Cassidy Stainless Steel Finish Widespread Lavatory Low Arc Spout Bathroom Sink Faucet INCLUDES Two Lever Handles and Matching Metal Pop-Up Drain D1311V Now!